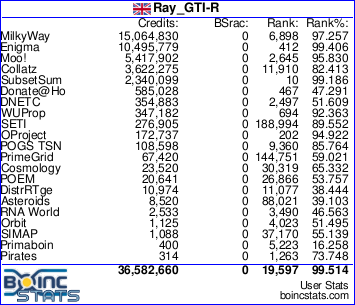 DistrRTgen has been added to the BOINC project list. Its goal is to give the world's security experts the best tools available for detecting weak hashes, helping to improve methods of password protection. We can be certified that one can have confidence in this project? Message 40148 - Posted: 12 Sep 2011, 2:18:20 UTC - in response to Message 39566. "By distributing the generation of rainbow chains, we can generate HUGE rainbow tables that are able to crack longer passwords than ever seen before"